I am loving Pinterest! Why oh why did I not come up with and execute this totally awesome idea?!?! Oh well, I have pinned some absolutely wonderful ideas lately, so I thought I would share a few of my favorites! Doesn’t this Alfredo Lasgna Roll Up look delicious?!?! This is a must try recipe! Go check it out at Artsy Fartsy Mama! Love this Sweet and Skinny Ruffled Headband made by Beverly at Flamingo Toes! So cute and shabby chic! Check out this This Monster Tooth Pillow that Paige over at The Crunchy Mamacita made for her son! This pillow is still cool and boyish for all of those baby teeth! These are just a few awesome projects that I have been pinning! Follow me on Pinterest to see more! Yesterday was definitely a “Let’s just chill day.” Since it was the first full week of school, we have been going non-stop. When I am at school all week, I am less likely to want to go on the weekends. I just need to have down time at the house. So I decided we would make pizza and watch a movie with the kids! My husband likes to say that I am very spoiled when it comes to homemade food. My mom and my grandmother always bakes rolls and lots of yummy desserts. So I come by this honestly. I just don’t have as much time as I would like to bake. This is also fun for the kids! Both my kids rush in when I am making pizza! They are always fighting over who is putting on which toppings! So here is the recipe for the homemade pizza dough that I grew up eating! This recipe will make 1 pizza crust. Start by adding the warm water to a bowl or big stand mixer. Next, add your yeast. Stir water and yeast until the mixture is bubbly. Add your salt and oil to the mix. Lastly, add your flour a little at a time. The dough should be stiff. Knead your dough. Put a little oil in the bottom of a big bowl. Place the dough in the bowl and cover with plastic wrap. I usually wrap the bowl in a towel so it will rise quicker. Let rise about and hour or until it doubles in size. You will then roll out the dough on your pizza pans and add your desired toppings! Bake at 375 until crust is light brown and cheese is melted. Overall, it was a cute and family friendly movie! Fun times and memories made! We have officially finished our first “REAL” day of Kindergarten! I am proud to say that I survived! It is a fun place to be, but oh so hard at the beginning! 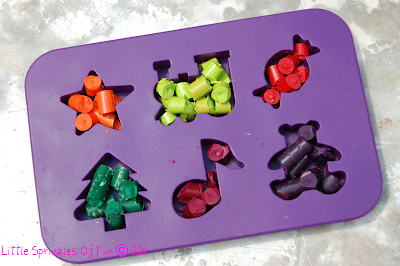 Here is a fun little activity that we always do on the first day of school! This one came from one of my fellow Kindergarten teachers! 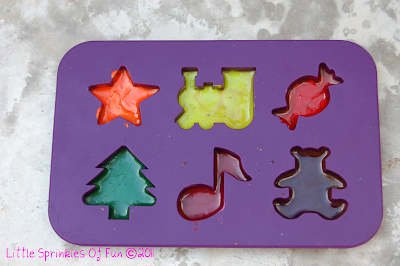 All you need is red and blue Play Dough or two Play Dough colors that will mix to make another color! Make some balls out of the blue Play Dough. Flatten out a piece of red Play Dough. Finish by rolling the red Play Dough around the blue Play Dough. 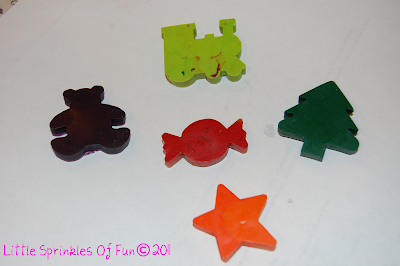 Place Play Dough in a baggie and attach this awesome poem to it! Is a special gift for you. We will have an awesome year! Okay, can you guess what will happen?!?! The kids absolutely LOVE IT! I love that the kids REALLY do think that it is MAGIC!!! They always get so excited watching it change colors! Oh…to be a kid again! Well, here we go again! School starts and I am M.I.A.! Me and my co-workers have been busily working to train almost 100 Kindergarteners in the routines and procedures of school! It has been a long and crazy week! Next week I will start with my own group of 20 Kindergarteners! This is always a fun and exciting time of year; but also exhausting. Please bare with me! I hope to write up several post this weekend. I am so sad that my summer is over. I am already missing my freedom to blog and link up whenever I choose! I would LOVE to give guest posting a try! If you are interested in writing a guest post (to help me out until all this craziness settles down) please send me an email! Thanks! I am sure many of you have heard of the book/movie The Help by: Kathyrn Stockett. I have been hearing about this book all summer and have been wanting to read it! Well...I finally got my hands on a copy! A teacher friend is letting my read hers! I would rather read the book before going to see the movie. So reading it is on my agenda for the weekend! Many of my teacher friends have been raving about this book, so I am sure there are many of you out there doing the same! I wanted to mention a book club that will be going on over at Measured By The Heart. Connie will be leading a discussion on this book at the end of August. SO if you have not read it...you still have time! I have been involved in her last several book club discussions and it is always fun to interact with other bloggers and to see what others are thinking! Let me know if you have read The Help! 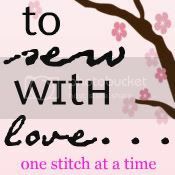 I am a finalist at To Sew With Love's Finest of July 2011! I was pumped that two of my projects made it into the running in July! Voting is taking place from now until Saturday! You can vote for 2 projects everyday! I would LOVE your votes! My two projects are the 1.) 4th of July outfit and 2.) Noodle Fun. Just scroll down to the voting box at the bottom of her post! 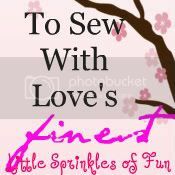 Thanks for supporting Little Sprinkles Of Fun!!! I have had my kitchen table and chairs for about 10 or 11 years now. I still like the set so I was trying to make it last a little longer. I was however not in LIKE of the upholstery on the chairs. After having kids the chair cushions started taking a quick turn for the worst. The fabric was way too light and every speck of dirt and spill showed up way too much! I was shopping at Hobby Lobby several months ago, when I came across two 1 yard remnant rolls. The rolls were around $4.00 each. I looked around and found out that this material had originally been $20.00 a yard. SO, I scored this awesome fabric for $8.00 for 2 yards! That means it cost me about $2.00 a chair! Can’t beat that! Here is one of the chairs after the redo. WOW! Can you believe the difference that made in these chairs?!?! If you have a chair or a cushion that needs to be recovered…go ahead and give it a try! It will make you feel like you have a brand new piece of furniture! I love it when bloggers are REAL! You KNOW that not ALL projects go according to plan! Sometimes, it just makes you feel better to know that all of these crafty people in blog land are not perfect. So I am going to share my recent Project Gone WRONG. I found this awesome tutorial on Pinterest! Jessica @ Wednesday Custom Designs created these awesome string balls! I have found tons of tutorials, but this one is very detailed! I just knew these were going to be awesome! I was going to hang these cute little babies in my classroom…umm NOT! 1.) It is too hot outside and my balloons started shrinking up. So that resulted in the wet yarn shrinking as well. 2.) I should have rubbed Vaseline on the balloon so the yarn would not stick to the balloon. Umm…yea..I kind of missed that little detail! Oh well…you nail some and then you totally MESS some projects up! I still really want some of these to hang in my classroom, so I will probably try this again soon! I will let you know how it goes the 2nd time around! Thanks for reading the good and the bad! IT IS HOT, HOT, HOT!! In Arkansas, we were sitting at well over 110 degrees in some parts! REALLY?!?! I can't believe how incredibly hot the weather has been all summer. It is really rare for us to see temps. above 100 were we live. Honestly, I think I would take that 2 feet of snow we had back in Feb. anytime vs. this HOT weather! The crazy thing was that we have not seen a cloud in the sky the past few days. Just guess what happened a few mintues after setting them outside? Umm..CLOUDS! YEP! It turned cloudy for about 30 minutes. I am not complaining! It was just really funny how things work sometimes! So..even with the clouds our crayons melted pretty quickly! The kids now have a couple more fun crayons to use when coloring! What is the temperature in your area? Have FUN and STAY COOL! !